Well looks like Rihanna had a busy weekend! !Fresh off of the MTV VMAs the pop star flew right to London to participate in the closing Ceremonies for the Paralympics! 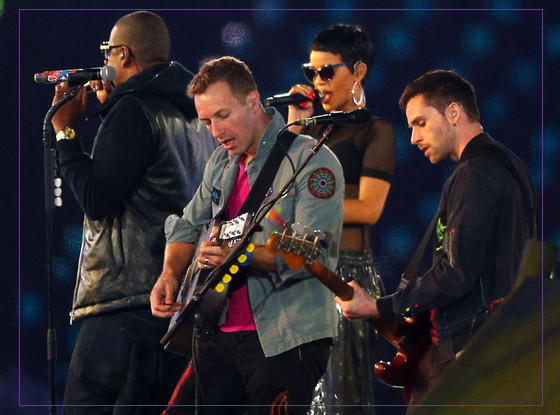 Rih joined Coldplay who covered all of their hits to a huge crowd of athletes and fans. To add greater to great, Rih and Coldplay were also joined by Jay Z!!! It definitely was a crowd pleaser for attendees and fans watching online. Jay Z was fresh off of his vacation with his wife Beyonce and their little girl Blue Ivy!! What a great way to show support to such an amazing event! Check out some of the footage of their performances below!